Despite this summer’s unusually hot and dry conditions, things are looking pretty good here at Hayefield. It really shouldn’t surprise me, because late summer and fall have always been the best time of year here, garden-wise. 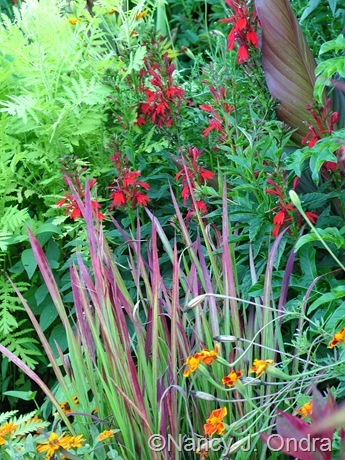 Some of the perennials that started blooming in June and July are still looking respectable, as with the wild quinine (Parthenium integrifolium), above, and the late Dutch honeysuckle (Lonicera periclymenum ‘Serotina’), below against the foliage of ‘Australia’ canna. 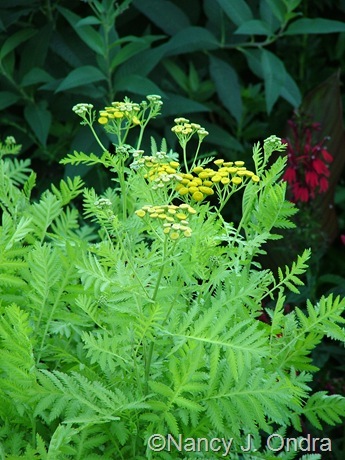 Some clumps of ‘Isla Gold’ tansy (Tanacetum vulgare; above) have been blooming for well over a month now, but I cut this one back by half in late June, so it’s still looking fresh now. The ‘Black Dragon’ Orienpet lilies are just about done but lasted long enough to overlap with the white Japanese burnet (Sanguisorba tenuifolia var. alba) this year. It’s not all leftovers for late summer, though. 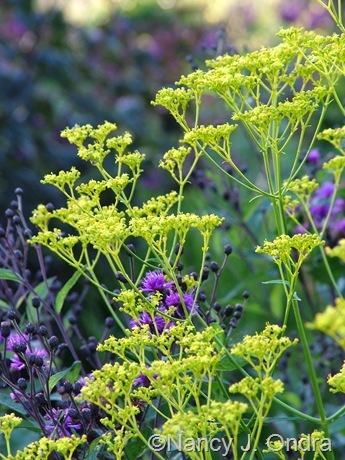 August brings on one of my most favorite perennials: golden lace (Patrinia scabiosifolia). 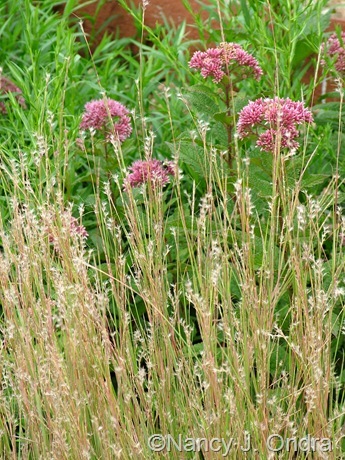 It starts at the same time as the ironweeds (Vernonia) and overlaps with the later part of the Culver’s root season (below, pinkish Veronicastrum virginicum ‘Erica’). 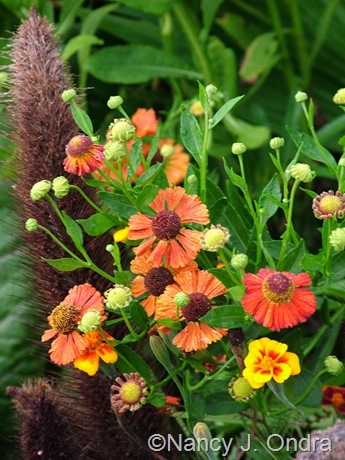 Even though the early ‘Mardi Gras’ Helen’s flower (Helenium) is finished now, the season continues with ‘Coppelia’, above with ‘Jade Princess’ millet (Pennisetum glaucum). 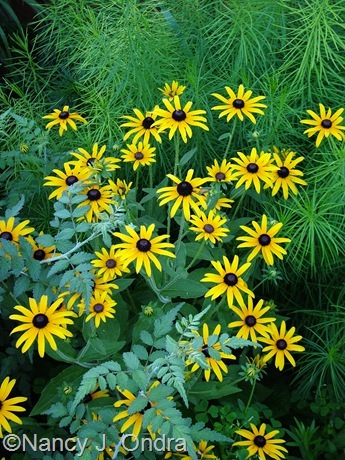 Orange coneflower (Rudbeckia fulgida var. fulgida) is pretty ordinary as perennials go, but its fresh, bright daisies are a welcome addition to the garden this time of year. 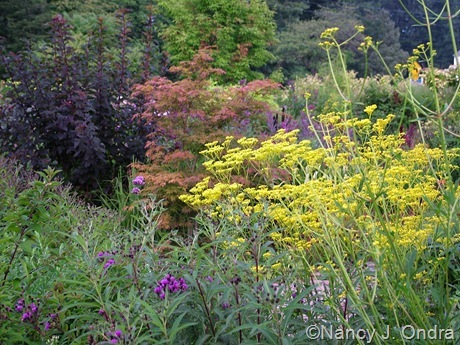 Below, it’s with ‘Silver Fern’ ghost bramble (Rubus thibetanus) and Arkansas bluestar (Amsonia hubrichtii). Late summer is prime time for the burnets, too. 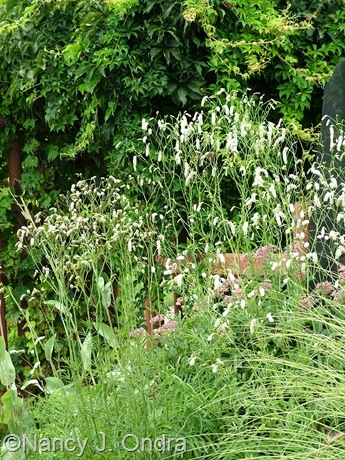 Above, the nodding, fuzzy tails of white Japanese burnet (Sanguisorba tenuifolia var. 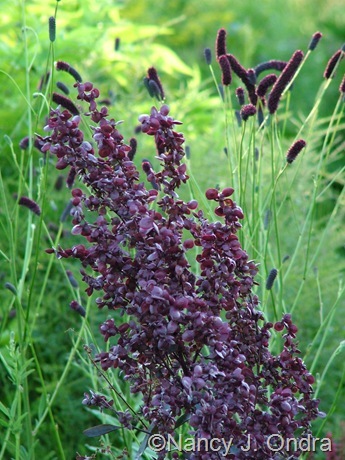 alba); below, the smoother, reddish purple spikes of plain old S. tenuifolia against ‘Grace’ smokebush (Cotinus). And below, great burnet (Sanguisorba officinalis) – at about two-thirds of its usual height due to a mid-June, by-half cut-back – with the seedheads of ‘Mardi Gras’ Helen’s flower and some spiky celosia. 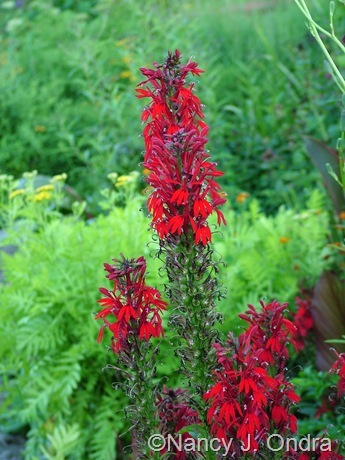 Cardinal flower (Lobelia cardinalis) has been in bloom for a few weeks by now, adding a delicious dash of bright red to the front garden. Below, it’s with Japanese blood grass (Imperata cylindrica ‘Rubra’), a bit of canna and marigold, and some ‘Isla Gold’ tansy. 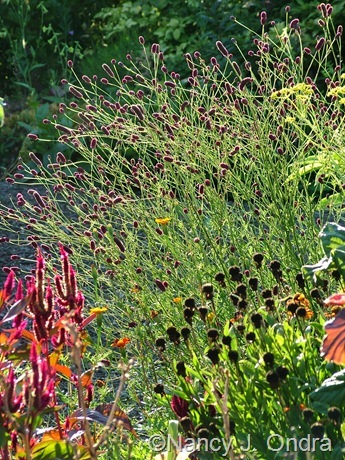 By late summer, many of the tender perennials and annuals are finally hitting their stride. 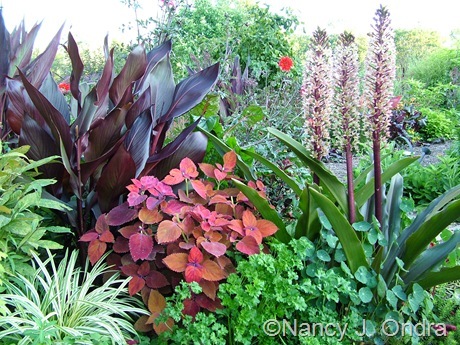 Above is ‘Sedona’ coleus (Solenostemon scutellarioides) with ‘Australia’ canna, ‘Oakhurst’ pineapple lily (Eucomis comosa), ‘Tripled Curled’ parsley, and variegated blue lilyturf (Liriope muscari). The ‘Bishop of Llandaff’ dahlia growing in the same area is better than ever this year. ‘Imagination’ verbena seeds around freely, but I’m happy to have the seedlings for use as fillers; they transplant easily and bloom beautifully for the rest of the growing season. 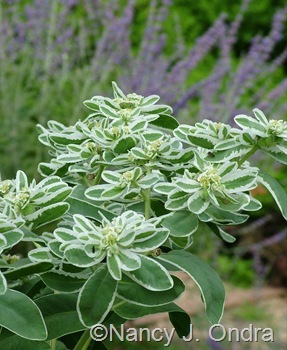 Snow-on-the-mountain (Euphorbia marginata), below, also self-sows, but it doesn’t transplant as readily, so I mostly leave those that are in acceptable spots and pull out those that are in the way. Purple devil (Solanum atropurpureum), which made its first appearance last month, is still looking marvelously malevolent. Another oddball annual, new for me this year, is the carnivorous, yellow-flowered devil’s claw (Ibicella lutea). This one deserves an entry of its own in a future Three Neat Plants post. 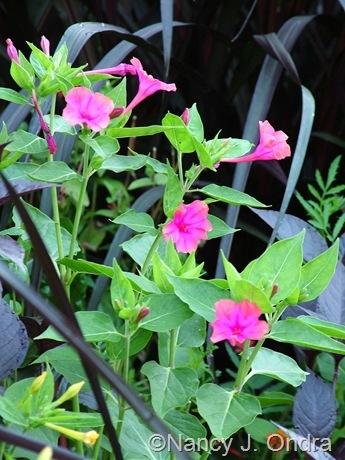 Last month, I showed ‘Marbles’ four-o’clock (Mirabilis jalapa) with pink-and-yellow blooms. 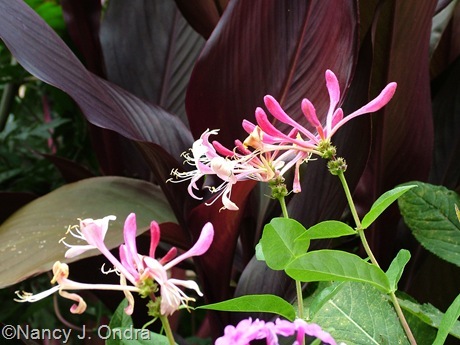 Not all of the flowers are multi-colored, though: some are solid pink. 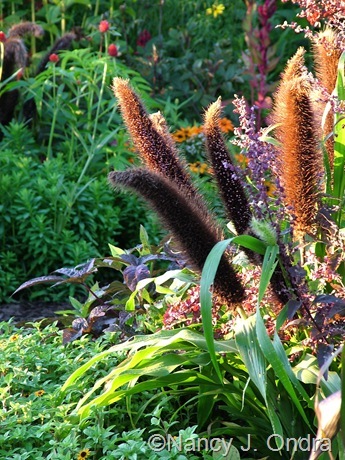 Above, they’re set against basically black ‘Vertigo’ fountain grass (Pennisetum purpureum). 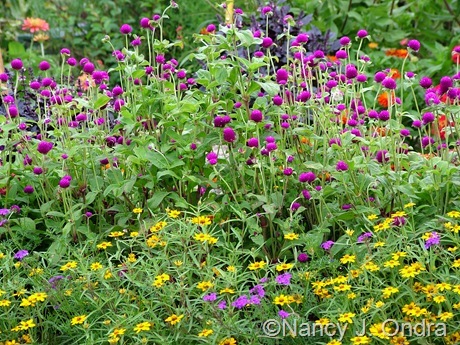 Below, the even more vibrant, violet blooms of globe amaranth paired with classic zinnia (Zinnia angustifolia). 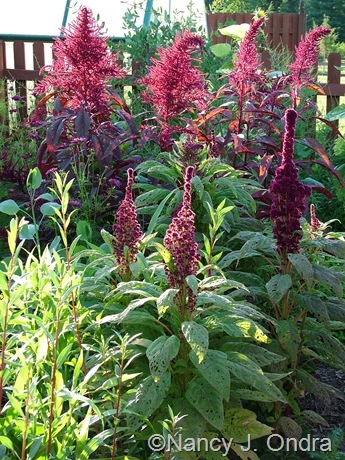 August is amaranth (Amaranthus) time, too: above is ‘Elephant’s Head’ in front of ‘Hopi Red Dye’; below is a closer view of some ‘Hopi Red Dye’ plumes. I don’t often grow zonal geraniums (Pelargonium x hortorum), but I really like ‘Black Velvet Scarlet’, above, which is easy to grow from seed. 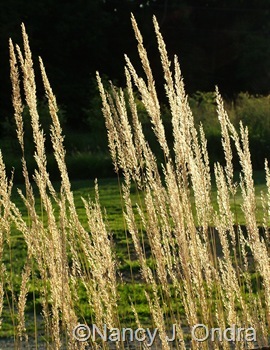 Yet another element that makes late summer such a great time in the garden is the ornamental grasses. They’re especially pretty in the low-angled light at dawn and just before sunset. 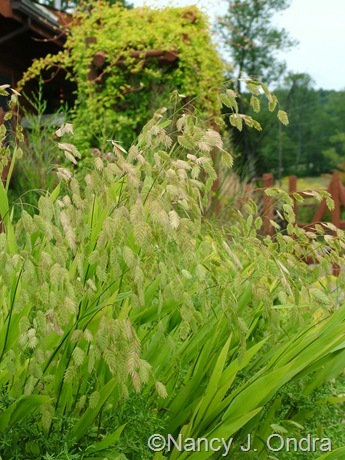 Above is ‘Jade Princess’ millet; below is ‘Karley Rose’ Oriental fountain grass (Pennisetum orientale). Above, Siberian graybeard or frost grass (Spodiopogon sibiricus); below, ‘Karl Foerster’ feather reed grass (Calamagrostis x acutiflora). 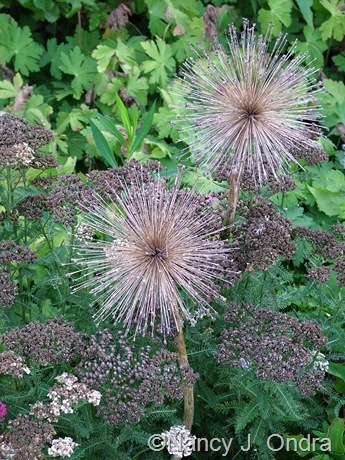 Above, little bluestem (Schizachyrium scoparium) with ‘Little Joe’ Joe-Pye weed (Eutrochium dubium). And below, Northern sea oats (Chasmanthium latifolium). Above, the flowers and developing seeds of annual Job’s tears (Coix lacryma-jobi). 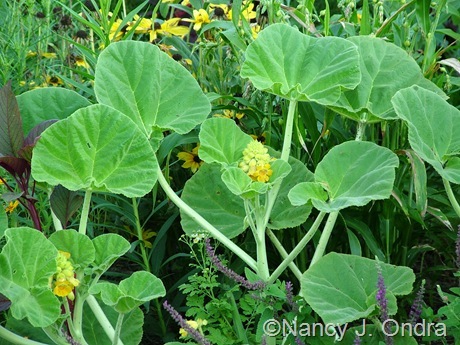 …above, ‘Amazone’ tuberous Jerusalem sage (Phlomis tuberosa); and below, the annual red orach (Atriplex hortensis var. rubra). I think that’s enough of the flower-related highlights for this month. 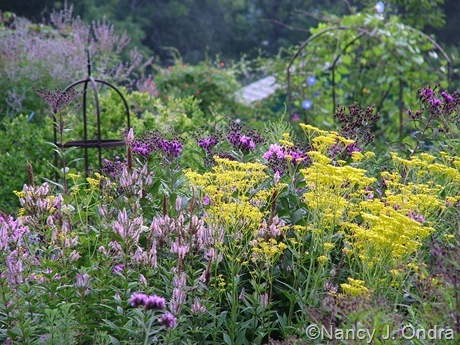 You can find links to lots more late-summer excitement in Carol’s main Garden Bloggers’ Bloom Day post at May Dreams Gardens. 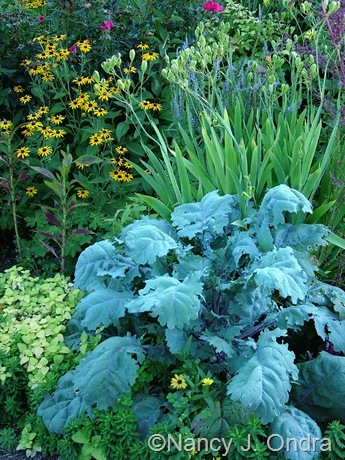 Above is ‘Russian Red’ kale with orange coneflower (Rudbeckia fulgida var. fulgida) and blackberry lily (Iris domestica [Belamcanda chinensis]). 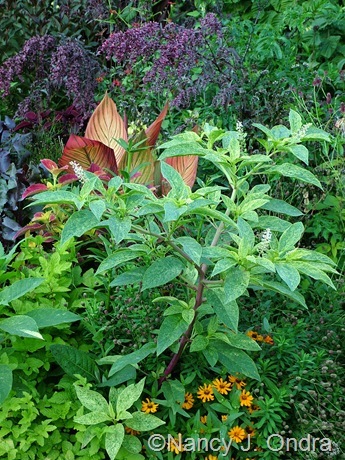 Below is variegated pokeweed (Phytolacca americana ‘Silberstein’) with Tropicanna canna (Canna ‘Phaison’), red orach (Atriplex hortensis var. rubra) and ‘Profusion Orange’ zinnias. 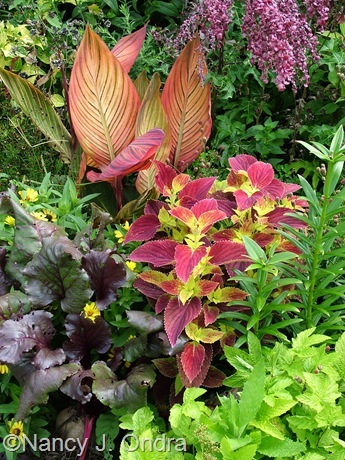 Above, ‘Bellingrath Pink’ coleus with ‘Bull’s Blood beet and Tropicanna canna. Below, a much quieter combination of ‘Berggarten’ sage (Salvia officinalis) with lavender cotton (Santolina chamaecyparissus), common thyme (Thymus vulgaris), lavenders (Lavandula), and ‘Grey Lady Plymouth’ geranium (Pelargonium). 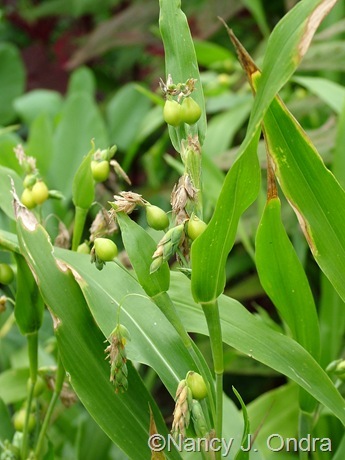 And a couple of corns (Zea mays): above, dwarf, white-striped ‘Tiger Cub’, and below, tall, yellow-striped ‘Old Gold’. 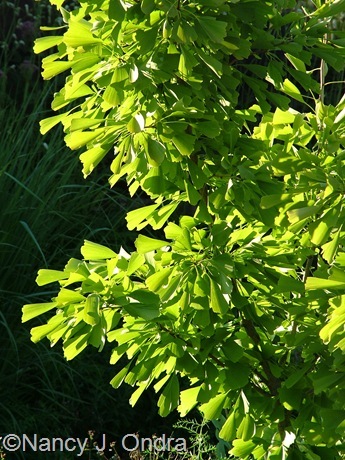 For more lovely leaves, check out Pam’s Foliage Follow-Up post at Digging on the 16th. 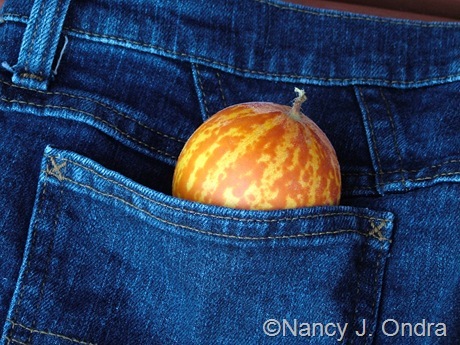 …except that the pocket melons are the size of tennis balls and ‘Tigger’ fruits are roughly softball-sized. Both have a powerful fruity scent, which makes them nice to have sitting on your desk. 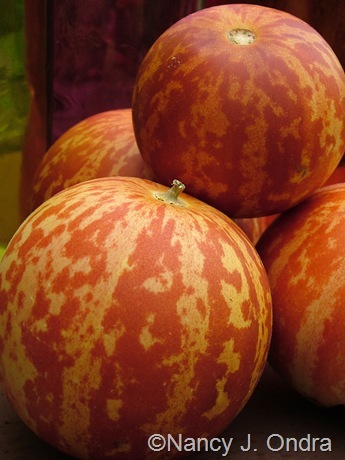 ‘Tigger’, though, is touted as an edible, and it is edible, fair enough, but it’s also boringly bland – a disappointment, especially considering how prolific the vines are. Oh, well; it’s still a beauty! I just love your bloom day photos! Such brilliant color and marvelous combinations. I see lots of annuals and tender plants in your collections. How much overwintering of the tropicals do you do? Do you do different annuals every year? Or a certain set every year, and some new ones too? I’m curious about how you place your annuals, is it a grand plan? Or do you just fit them in where ever? I sometimes have nice annuals, but there’s never any room for them. Thanks, Brenda. Most of the annuals and tender stuff I grow is from seed; just the dahlias, cannas, and pineapple lilies come into the basement for the winter. Many of the annuals self-sow at this point (even sweet potato vines); the rest I start indoors. I do have some favorites that I rely on each year, such as the Profusion Series and classic zinnias, spike celosias, and chard, but I also try to find a few new things each year. They’re sort of arranged by color: bright flowers and chartreuse and purple foliage out front, and whites, silvers, and blues on the side, but beyond that, the volunteers grow wherever they want, and I tuck the rest in wherever there’s empty space. Thanks for letting me know about the comment box problem. I wonder if anyone else is having the same issue? It may be because WordPress has retired my theme and wants me to switch to the newer version. 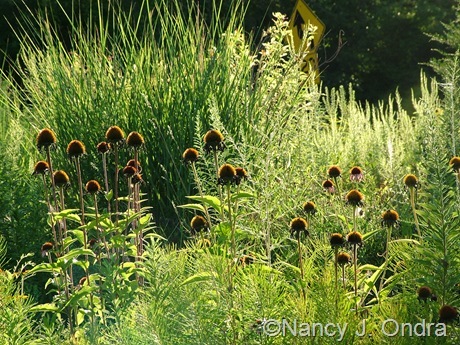 Beautiful Nancy, your garden is an inspiration! Welcome, Laurel, and thank you so much for your comment. I hope your garden is doing well too! Lovely photos and plants as usual. Inspireded by you I imported a lot of Canna bulbs(?) this spring from the Netherlands and planted in pots around the garden. But…there are only two plants which are flowering now, some yellow with orange spots. Very lovely, but where are the others!? I think you need a greenhouse in this climate to see them flowering earlier. Hi Susie – I’m sorry to hear that your cannas aren’t turning out as well as you hoped. Maybe they’ll be better next year. Really, though, I don’t have much luck growing them for the flowers; I use them mainly as foliage plants. Beautiful plant pairings. Your garden looks to be a paradise. Thanks, Donna! It really does look great now, if I may say so – especially since we’ve *finally* gotten a soaking rain – and I have hopes of things getting even better for fall. Nancy, it’s always a joy to see you bloom day posts. I swear, only you can make seed pods look so dazzling! Isn’t it glorious how the low-angled light outlines the details in the pods and seedheads? Shooting almost into the sun is tricky, but during the recent spell of very sunny weather, it was pretty much my only option. Gorgeous. A beautiful homage to the plant world. Thank you for sharing this beauty with us. The garden is much happier now than when you saw it, Dorothy. I’m sure you’re as grateful as I am for the rain (though not for the storms). Your garden is such an inspiration Nan. I’ve yet to see anyone combine color and texture so exquisitely. How kind, Linda. Honestly, it’s an inspiration for me too. Just a few weeks ago, it seemed unlikely that anything would survive the summer, and now it looks amazing. 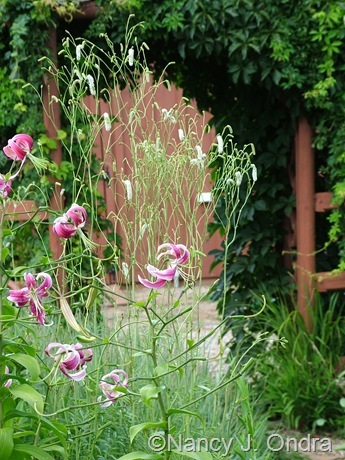 Although your blooms and plants are simply stunning, it is the combinations that impressed me the most. You have so artfully placed blooms next to textural or colorful foliage or blooms next to blooms that complement each other so well. I enjoyed my visit! Happy GBBD! Thanks for stopping by, Sage! But say instead that the plants have placed themselves so artfully and I was just lucky enough to capture them with the camera. This is my first visit and wow, Nancy. Every photo is glossy-magazine-worthy. Seriously, beautiful. That ‘Russian Red’ kale is to die for and how you have it situated is just genius. You’ve definitely got not only a designer’s eye but a photographer’s eye as well. I’ll be back. A double welcome to you, Grace! I’m delighted to have you as a reader. That kale is a beauty, isn’t it? Inspiring combinations … fantastic photos. Thanks for the tour. I thoroughly enjoyed it. Thanks, Joene. Happy Bloom Day to you! Another lovely visit to your garden. Always interesting to see the play of light in your photos and how you angle your shots. I learn alot every post you make. I really liked the amaranths this time as well as the giant kale. The quiet shot of the sage, lavendar and santolina was very good too… a nice combo of silver, gray and green. I have not tried annuals to much extent except in pots, but next year I’m goint to give it a whirl! I plant annuals a lot less than I used to, now that the perennials have filled in, but I can’t imagine being without them altogether. (Considering the self-sowing issue, I probably won’t ever be without them even if I wanted to be.) 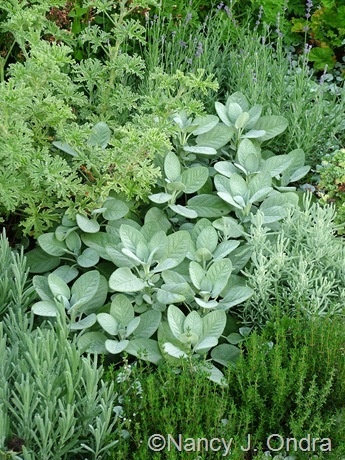 Thanks for appreciating the herb combo too: that was a wonderful find in the new fragrant-herb part of the Happy Garden. Wonderful vignettes! I’m glad you provided the name for the ‘Imagination’ verbena. I couldn’t find all of my seed packets (somewhere in the wheelbarrow instead of my filing system). 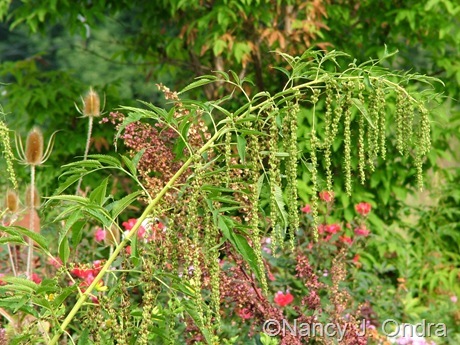 The variegated pokeweed is on my list for next year. I’ve already ordered the wild quinine (and other seeds) thanks to your source recommendations. Thanks for sharing so much information and inspiration! It took me a bit of research yesterday to track down the verbena’s correct name. I always remember it as ‘Illumination’ and then wonder why I can’t find it on Google. Maybe now we’ll both remember it. 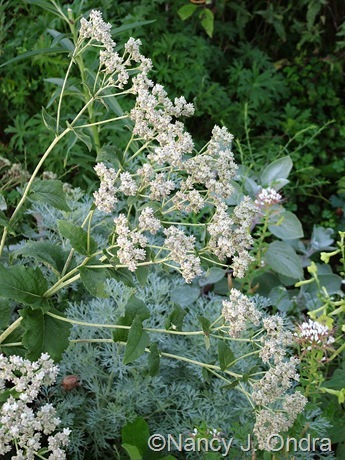 Let me know if you want seed of the variegated pokeweed. I know a lot of people freak out about the idea of deliberately growing pokeweed, and I’ve spent my share of time getting rid of unwanted seedlings of the species. ‘Silberstein’ seeds around some too (and as far as I can tell, seeds true), but the seedlings are much less vigorous, to the point where they not infrequently get crowded out by more lively companions. Great tour and photos for sure. the snow in summer is blooming prolifically on the Kansas prairie right now. Any tips on collecting seed? also on the verbena ‘imagination’? Great post and photos as always. 5 star. Unfortunately, I can’t be much help, Greggo. I’ve never tried collecting from the verbena, because it’s so much easier to let it self-sow and then move the seedlings. It must drop a fair amount of seed, so I don’t think it would be too hard to collect some. I’d try shaking the browned seedheads over a dish to see if you can catch them before they drop. The Euphorbia marginata is tricky because the seed capsules pop when the seed is ripe, which is why it often ends up several feet from where the original plant was. You could try cutting off the plant tops (wearing gloves to avoid the sap) as soon as you notice the green seed capsules turning brown and put them in a large paper bag to capture the seeds when the capsules ripen. wow, Nan! Always a pleasure when you capture your stunning garden in photos. 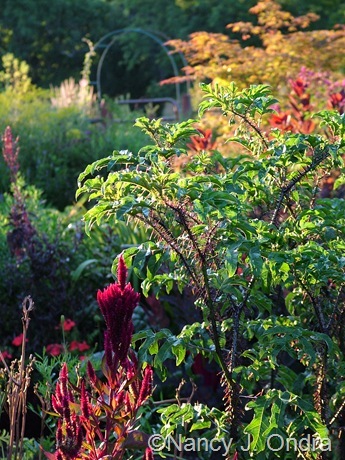 Hands down one of my favorite gardens… you are a master with combinations and color. Simply magical. Thanks so much, Meems! Hope you had a great Bloom Day. Wonderful, inspirational and a living portrait from a true artist. I wish now that the PHS tour was this month instead of next month. I’ll keep my fingers crossed that things still look good for the event. I look forward to meeting you and your wife then. 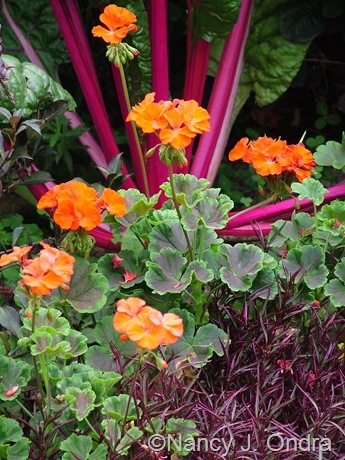 Your combination of the zonal geranium backed by chard? raises it to a whole new level. Of course, all combinations are grand. I do agree with the tiger melon flavor…bland is being kind. It is very pretty though and perhaps there is a chutney which could be made from it which would taste good. Really enjoyed the gorgeous photos and detailed descriptions. What I appreciate the most, though, is what you mention about care, siting, etc. For example, so helpful to know what you cut back earlier. Your comment is very helpful, Barbara. That’s the kind of information I like to read, and it’s useful to know that others find it of interest too. Nan, I too am a new visitor. I am bowled over by your photos. Could I ask you what camera you use? And do you use a tripod? I am a designer, but just have not yet been able to capture vignets the way I want to. Thanks so much, Barbara. I’m delighted to have you as a reader. No, I don’t use a tripod. The camera is a Fuji FinePix S7000, always used on the Auto setting. It’s about 7 years old and basically obsolete now, but still good enough for my purposes. I hope it lasts a while longer yet; I dread having to find one as good as it turned out to be. Oh Nan, just gorgeous as always! I have a weird question on getting parsnips to flower. Will they flower in their 1st year or are they biennial – growing a root first and then flowering/seeding? 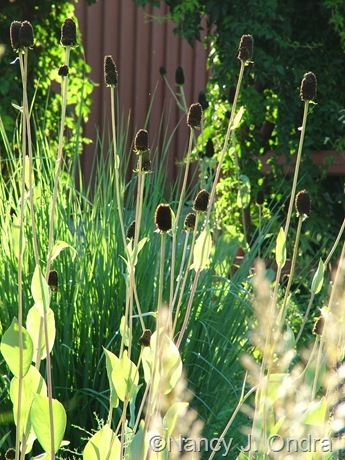 Love your use of grasses and the giant burnet is sublime – I garden in New Zealand and I’ll have to scout around for it. I too, appreciate that you take the time to explain about sighting, light, prunings, oddities, growing conditions etc. It makes this a learning blog and not just a craving blog! Hi Kerry! Parsnips are usually biennial, so figure on flowers the second (or sometimes, the third) year. Wild parsnips are actually considered a weed around here, but they’re very pretty in bloom, don’t you think? I hope you can find a source for the burnets; they’re kind of slow to get going but worth the wait. Have a great day in your garden! At the risk of sounding a bit dim, are yours wild parsnips or regular edible ones? We only have edible ones in NZ. We have a wild carrot that has pretty lacy white umbels a bit like Queen Anne’s lace and that’s definitely a pest here. I liked the parnips because of the tall, airy, yellowness. I have a huge country garden with a black/lime/chartreuse/red theme around a large natural pond. I’d like to naturalise parsnips throughout this area. The parsnips I’ve shown in previous Bloom Day posts are in my garden but look identical to the ones that bloom in wild places around here. I can’t find any references to there being distinct botanical differences between the two; some say that the wild ones are “less palatable” and others that they are sweeter than those from the garden. I did find a number of references to the second-year plants sometimes being dangerous to handle on sunny days (causing really nasty blisters on exposed skin), something you might want to be aware of. Do you have access to Patrinia scabiosifolia? It’s blooming here now and even more ornamental, I think, with brighter yellow umbels. As always, Nan, you are giving me more inspiration for next years garden! 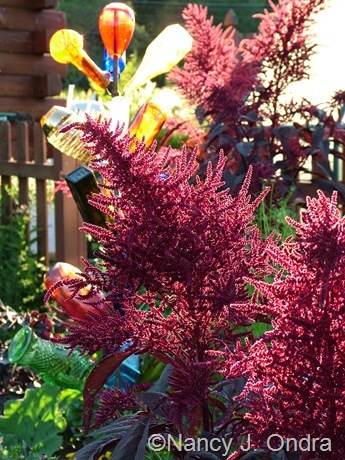 I’m so jealous of your Sanguisorbia…mine must need way more sun as they are soooo floppy, I need to bite the bullet and move them this fall. 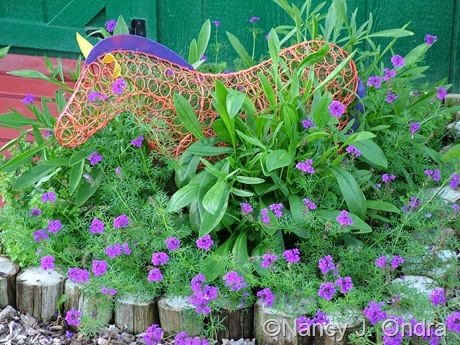 That Verbena is adorable…love that filigree foliage! 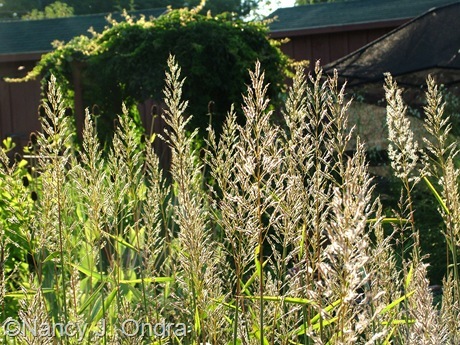 I can’t believe your Little Bluestem is blooming already…mine haven’t even shot up the spikes yet. 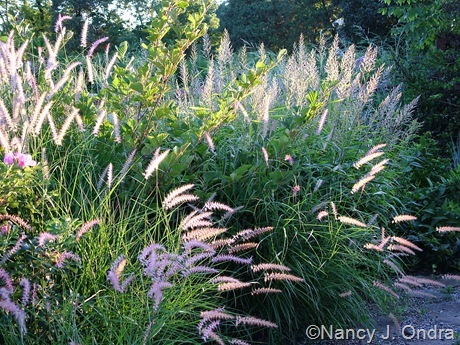 That shout of the Patrinia, Vernonia and Veronicastrum is pure magic…just stunning! As always, I love when you highlight the beauty of spent flowers and seedheads…the Amazone Jerusalem Sage is particularly striking in that photo. Yep, it could be the sun issue with your sanguisorbas; it could also be a matter of time. My plants seemed very floppy for the first several years and needed lots of propping-up with Y-stakes. By about year 5, they seemed strong enough to stay up on their own. I’ve also taken to cutting some back by half in early summer to keep them a bit shorter, though I don’t like them to be *too* compact, because then it spoils their grace. By the way, I haven’t forgotten the seed I promised you; they’ll be on their way soon! Hi Nancy! You have some great plantings like always! I tried ‘Tigger’ this year mostly as an ornamental because it looked so cool but found it to be light and sweet in flavor. Not as overwhelmingly flavorful as a cantaloupe but with a mild flavor. I trellised our vines and they got a good deal of sun in our raised beds. I think it’s a melon that would be perfect mixed with some strawberries. Also I just wrote a post on the cotton seed you sent me, thanks again! Hi Dave! Reading your post on the melons is what reminded me to check my own patch to find the first ripening fruits. They’re not bad, I guess; just not what I was hoping for. And, unfortunately, the alpacas won’t eat them either, even though they love most kinds of melon and will even eat too-big cucumbers and zucchini (they’re very handy that way). I’m so happy that the cotton performed well for you. My plants have been loaded with flowers, and I have high hopes for getting ripe seeds again this year – if we don’t get early frost. Nan: Wow, your shots are so inspiring. I only realized after I started reading your blog that I own most of your books. I love the interplay of foliage and flower. 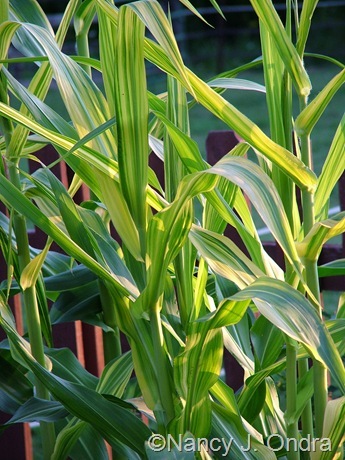 Along those lines, I was wondering where you got seed for those variegated corns. All I can find on the web are ones for a pink and white variegated one, which would not really work. Thanks for brightening up my work days! Hi Nancy! Always happy to provide a distraction. I’m glad you found your way here. The ‘Tiger Cub’ corn came from Park Seeds a few years ago, but I don’t think they carry it anymore. And the ‘Old Gold’ came from a seed trade with another reader this spring. I should have lots of seed of both to share this fall. Thanks, Alberto. You’re right: the other veronicastrums have been done for several weeks, but ‘Erica’ is still blooming even now. It started a few weeks later, as well, come to think of it. Wow, Nan! 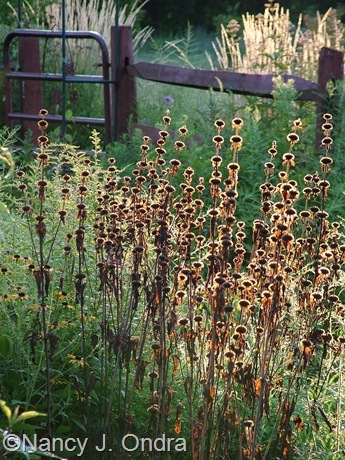 The colors in your Golden Lace, Ironweed and Culver’s Root combo pics blend so beautifully together. You have very good reason to be happy with your mid-August garden. It’s looking fantastic! I’m glad you got some rain at the right time to make it pop. Irene sure gave us a good soaking! I hope your garden wasn’t damaged too badly by the wind. You truly are an artist with your color/texture combos. ‘Sedona’ looks great with ‘Australia’ Canna and the Pineapple lilies. 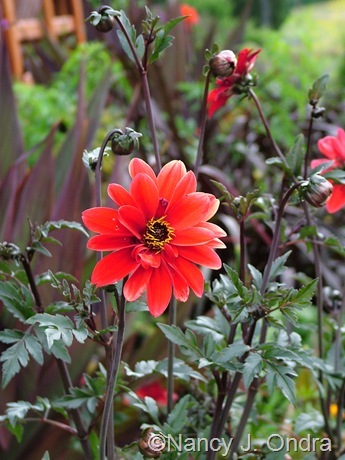 I love the dark stems on that bright colored Dahlia. 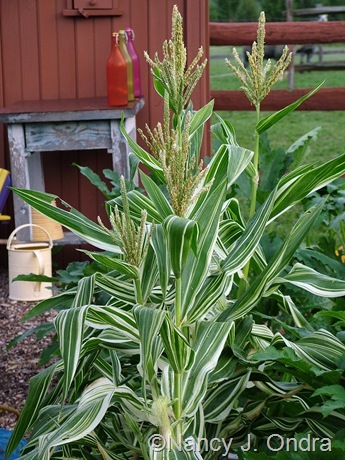 Thanks to your Pokeweed pic I’ve just realized what my mystery weed is that’s growing up by the barn. I can see why you like it so much. I love everything about it, especially those purplish red stems, but I know I must get rid of it before the seeds ripen and spread. P.S. My Mum is looking healthy. Keeping my fingers crossed for blooms. Hi Kerri! I’ve been thinking of you as I watch the ‘Sheffield Pink’ mums filling out this season. The garden did get pretty battered by the wind, but I’ve made good progress on repairs. We ended up with about 8 inches total of rain last week. Sure wish we’d had some of that a month ago! If we don’t get another storm, things should look pretty good for the next Bloom Day here. I wish a beautiful fall season for you! 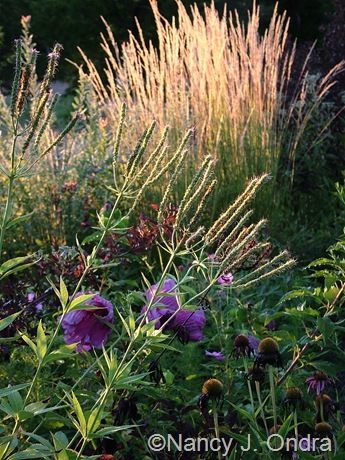 I’m new here – following the Garden Designers Roundtable on favorite plants. Must say that OH, I have never gone weak-kneed before over fall/winter photos of a garden! They are the most beautiful things I have seen in quite some time and I walk away renewed. I love how you combine the natives with other plants and it all looks perfect. Thank you for sharing! Welcome, Sara, and thanks for visiting! I’m so glad to hear that you enjoyed the photos, and I hope you stop by again. I came across this post trying to figure out if wild quinine self sows. I’m thinking it doesn’t, which means I want to buy another plant or two. I planted a very small one this spring, and it started blooming very shortly after being planted. I asked someone at the arboretum, where I purchased it, if I should take the blooms off. The young man there told me to let it do its thing. He was right to say that, because that plant has been blooming all summer, and it grew to about 3 feet high. I’m not going to remember all the other awesome blooms in your post that I wanted to comment on. I am excited for my giant coneflower to get tall next year. I love your amaranths! They are awesome! When we went on a rare vacation in 2007, we went on a home and garden tour in Beaufort, North Carolina. Several of those gardeners had pineapple lilies. I wish they grew here in our zone 5. Hi Sue! I think the wild quinine is self-sowing in the meadow here, but in the garden, I usually end up cutting it back before the seeds ripen, because it gets a bit sprawly. Good luck with yours. And yes, aren’t the pineapple lilies terrific? I find it’s worth the little bit of effort to dig and overwinter them in the basement to keep them going from year to year. 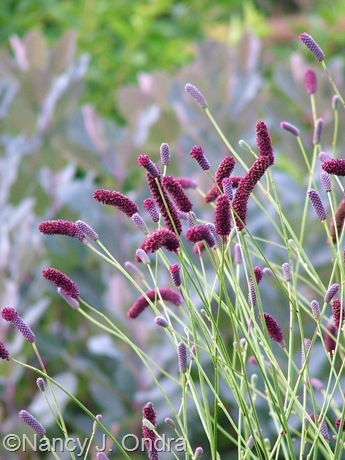 Nancy – As always when I land on your garden after a google search (sanguisorba officinalis, I think – it was a while ago and I’ve been lost in your imagery), I am astonished at your perfect sense of color, proportion, placement….. Just gorgeous. Whoever thinks late June is the best time in the garden needs to come here and get an eyeful of August. Thanks so much, Janet. I hope you found the information you were looking for, as well.